Project Sekong 2014: If our team misses an object the size of a walnut we could be setting the stage for a fatal accident. This cluster bomblet is broken in half. If whole it would be tennis ball sized---small but deadly. The detonator in the center of the bomblet is smaller still but is capable of traumatically amputating fingers or inflicting blindness. When our deminers pronounce land clear of UXO and safe to farm, they must be certain that even objects as small as a detonator have been destroyed. 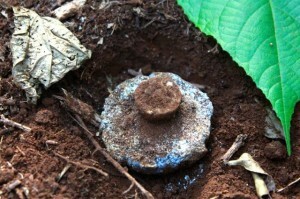 In the forest near Dak Yoy village we’ve encountered a surprising number of detonators from cluster bomblets that broke in half upon impact but did not explode. Whenever I see these walnut-sized devices in the soil I’m reminded of my friend Thongbay who has lived most of his life as an amputee. When he was just three year old he picked up a detonator that he spotted in the soil; it exploded, destroying his hand and nearly claiming his life. Thongbay’s father rushed him to a hospital that actually had a functioning surgical theater. After evaluating Thongbay’s wounds doctors recommended amputating his arm above the elbow. Thongbay’s father refused but the doctors wouldn’t easily relent; they argued that the more radical amputation offered Thongbay the best chance for survival. They told the father that if he refused their advice, he alone would bear responsibility. 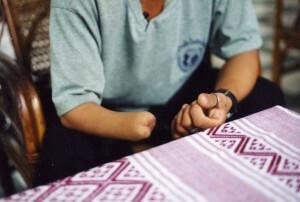 Thongbay was just a toddler when he picked up the detonator that destroyed his hand and nearly took his life. His father refused permission for surgeons to amputate his son's arm, reckoning that without the arm his son could not farm and without farming could not survive. When our deminers complete the search of a farmer’s land and declare it free of ordnance and safe to farm they must be confident that it is truly free of every potentially lethal object. If our deminers miss a single detonator or other dangerous object that size, the mistake could cost a villager his life or livelihood. It’s a great responsibility to bear, but our guys must work to that high standard if “clearance” is to have any meaning at all.